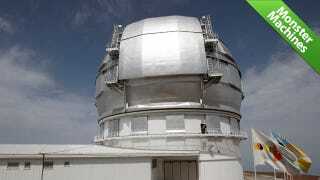 The Gran Telescopio Canarias Could Spot a Car's Headlights in Australia. From Spain. Light degrades the second it hits our atmosphere, making terrestrial astronomy and the search for dim or distant stars tricky. The Gran Telescopio Canarias observatory is the world's largest single-aperture optical telescope, and it's got some ingenious ways to compensate. The Gran Telescopio Canarias (GTC) is huge (as well it should be, for the $185million price tag). The 36 hexagonal pieces of its main mirror are made of Zerodur glass-ceramic, are 8cm thick and so precisely formed that if an individual pane were the size of the Iberian Peninsula, no surface imperfection on it would be more than 1mm high. The entire array spans a whopping 34 feet and sits atop an alt-azimuth mount using an active optics control system. The massive footprint of the mirror allows it to collect light faster than with a smaller one, which in turn allows for more precise manipulation of the light. With the active optics system, researchers can realign and deform the positioning of the main mirror segments as well as independently position the secondary mirror in real time. This allows the system to make thousands of corrections every second to prevent image degradation caused by environmental factors like atmospheric variations, climate, temperature, gravity. Even the dome that houses the telescope is built with a mechanical structure to mitigate vibrations. The GTC is built to detect the faintest, most distant objects. To do so, it employs the OSIRIS and Canaricam imaging systems. OSIRIS (Optical System for Imaging and low Resolution Integrated Spectroscopy) is a versatile instrument designed for low-resolution, long slit and multiple object spectroscopy (MOS). It also includes a brand new feature to telescopes of this size: narrow-band tunable filters that help detect very faint and distant objects. The Canaricam is a mid-infrared imaging system with spectroscopic, coronagraphic, and polarimetric capabilities. The GTC began its scientific observations in 2009 and is expected to reign as the world's largest single-aperture optical telescope at least until 2018, when the Thirty Meter Telescope in Hawaii is completed.